Border Security at Risk in TX House! Last week, Lt. Gov. Dan Patrick called for continued funding for border security. According to public statements and news accounts, Speaker Joe Straus shrugged off Patrick’s call with a notable lack of enthusiasm. This is about the safety and security of Texas. The People of Texas elected Gov. Greg Abbott and Lt. Gov. Dan Patrick with a mandate to secure the Texas border and deal with the high cost of illegal aliens and criminal activity related to cartels and transnational gangs running rampant in our State. Speaker Straus and his followers in the House seem to be trying to overturn last November’s election. Now, “We the People” must hold them accountable. Support funding for border security to continue through May by calling today! The Homeland Security & Public Safety Committee meets tomorrow 2/17/15 at 8 am. Ways & Means meets tomorrow at 8:30 am. A subcommittee of Appropriations meets on Thursday at 8 AM. Click here to download 2015 House Committees Contact Information. The three committees listed above are the committees to call first, but please call every committee member to inform them of your concerns. They will make decisions on bills that impact border security for EVERY Texan! (Only GOP are listed – since they all ran as conservatives and all say they support a secure border). Keep this list handy. As bills come to the floor of the House, you will need this list again. It also contains phone numbers for Governor Abbott. He needs to hear from all of you as well. Remind him that it is time for Texas to lead on border security and the rule of law! Politely tell them that you support continued funding of the Texas National Guard and DPS for border security. Funding for the Guard and Operation Strong Safety needs to occur through the end of the budget year and be funded in the upcoming new budget. Thank them and remind them that you will watch how they vote. 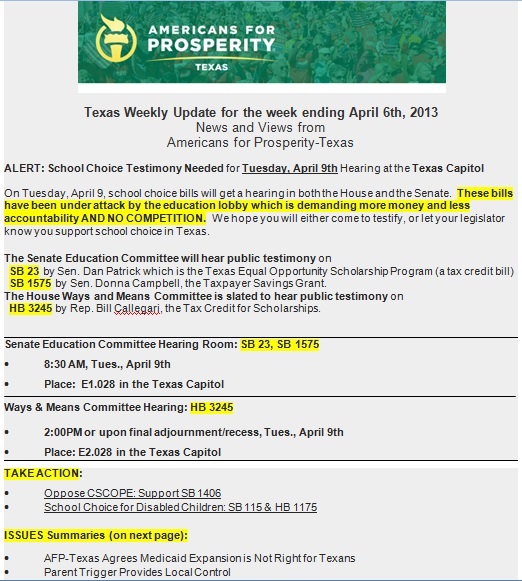 Call, tweet, and /or Facebook message your TX Representative Today! Ask him/her to #FireBoehner & VOTE for GOHMERT (or Yoho) for Speaker! Either will do. We just need 29 votes for someone not Boehner to put his speakership on hold. Even if we can’t defeat him, we can let them know that his appeasement and working with Pres. Obama is NOT what we voted for in November. Keep it short, cordial and leave your name and address if you live in the District. A group of 17 progressive Republicans orchestrated a similar stratagem in 1923, whereby they blocked the party’s nominee from securing a majority for nine consecutive ballots until the party leadership agreed to implement some of the reforms they were suggesting. Certainly the seriousness of our constitutional and political crisis warrants an effort like this from a group of bold conservatives in order to secure a reasonable compromise with a new Speaker, even if the choices that emerge are from the establishment wing of the party. The operative point here is that it is not sufficient to garner a plurality of the votes; the winner must secure a majority of the total number of votes cast. Consequently, given that there are 247 Republican members in the new Congress, if 29 members vote for someone other than Boehner – be it Rep. Jim Jordan, their favorite colleague, or even a private citizen – Boehner will be denied the majority of likely votes cast. 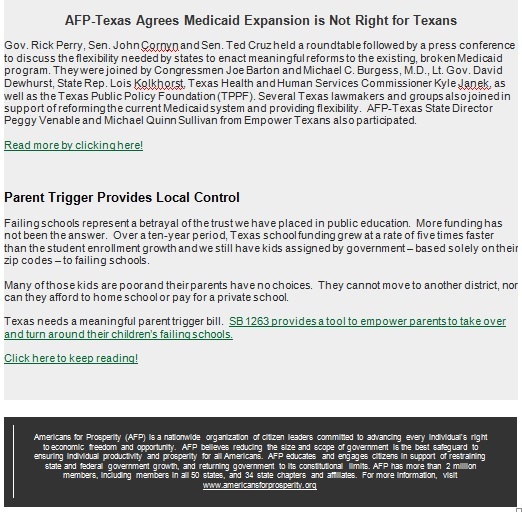 Click link below for PDF of AFP TX Action Email. Formatted for Publication. Content not changed.